Contains NO sulphates, fluorides or mineral oils. 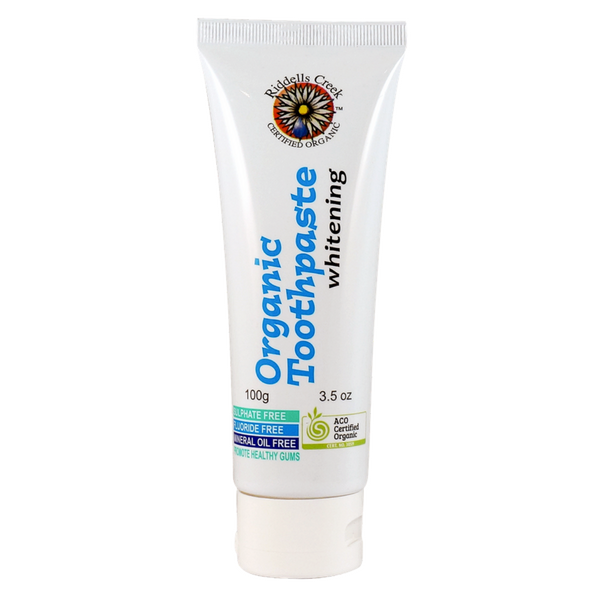 Riddells Creek Certified Organic Toothpaste is an effective natural alternative that cleans teeth and freshens the mouth. A natural way to whiter teeth. Organic Aloe Vera (Aloe barbadensis) Juice, Organic Ethanol, Purified Water (Aqua), Organic Saponified Coconut (Potassium Cocoate) Oil, Organic Saponified Olive (Potassium Olivate) Oil, Silica, Sodium Bicarbonate, Xanthan Gum, Organic Stevia (Stevia rebaudiana), Calcium Carbonate, Bamboo (Bambusa Arundinacea), Organic Spearmint (Mentha Spicata Crispa) Essential Oil, Organic Peppermint (Mentha piperita) Essential Oil, Soapwort (Saponaria officinalis) Extract, Organic Tea Tree (Melaleuca alternifolia) Oil, Parfum (Natural Preservative), Celtic Sea Salt (Sodium chloride), Organic Olive Leaf (Olea europaea) Extract, Parsley (Petroselinum crispum) Extract, Peppermint (Mentha piperita) Extract, Organic Rosemary (Rosmarinus officinalis) Extract, Sage (Salvia officinalis) Extract, Thyme (Thymus vulgaris) Extract.